Submitted by Jeff Buster on Mon, 10/26/2009 - 10:03. Just a friendly reminder not to waste any of your leaves' "solar power" by raking them to the street curb. 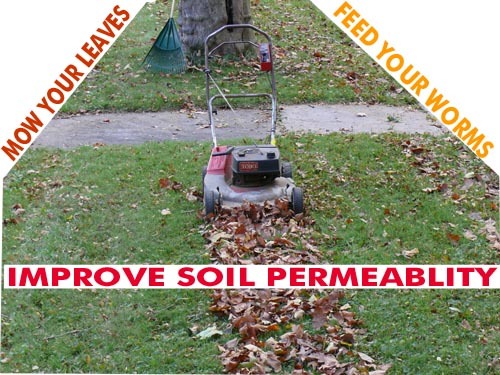 You can mulch them in place with a mower, or compost them in your back yard. This is the third year for this lawn - didn't have to water all summer because of the organics now built up like a sponge at the base of the grass - never had any burn out either. Forget Scotts. Submitted by Susan Miller on Mon, 10/26/2009 - 16:17. Yesterday I mowed my neighbor's leaves. Just now I used the reel mower to sort of crunch up the few that were wedged between blades of grass in the backyard. When the pin oak and the silver maple really let go, I'll need the power mower. It irks me though that the thing doesn't just start. Prime, prime, yank, yank, prime, yank, yank, prime prime, check gas - OK, check oil - OK, check spark plug connection - OK, prime again, yank, yank. Give up and wait for someone who's arm is longer than mine. I just need a course in small engines I guess. It wasn't a priority for me as a bunhead growing up. Mowing the lawn (what little we had in Florida) - that was my brother's job. Yesterday when I walked across the street to ask if I could have the leaves my neighbor was dutifully raking to the curb, I told him that he had put out a pile of gold on his treelawn. Gold? He looked curious, but said I could have them anyway. That may be the last pile of leaves I see on his treelawn. He is desperately trying to grow grass (go figure) on his sunny suburban frontyard. He could have (time permitting) fed himself and the entire block on that sunny spot. Nonetheless, his grass, he now knows, will be greener if he mows the leaves next time. Submitted by Jeff Buster on Mon, 10/26/2009 - 19:43.
take out the spark plug, make sure the electrode is clean - use a wire brush - and the gap is open about a 1/16 inch - little more than the thickness of a matchbook cover. . put two tablespoons of gasoline down the spark plug hole. Put the spark plug back in. Make sure the spark is not grounded check that handle on mower (if you let go it automatically stops engine) is not in stop position. Pull the cord. twice. I bet it starts. If it doesn't start, you have a spark issue I bet, not a fuel issue. If it starts and runs a few seconds and shuts off, you have a fuel problem. Carb is probably gummed up from sitting around all year. You can clean the carb - if it isn't a foreign object stuck in an orfice, with Gummout or another add-to-the-gas cleaner from the auto parts store. If that doesn't work, then you have to pull the idle and run needles out of the carb and blow out the orfices with compressed air. Start with the tablespoons of gas, or you can buy a can of engine starting ether and squirt it in the air cleaner as you pull the cord. Submitted by Susan Miller on Mon, 10/26/2009 - 21:56. Thanks for the suggestions, Jeff. The mower was running on Sunday (remember that I cut some of my neighbor's leaves), so I doubt that it is gummed up from sitting all year because I used it this summer and all the way through yesterday. It stopped a couple of times while I was mowing yesterday and the last time it stopped, it would not restart. I tried a few times and then thought I'd better let it rest. I sometimes feel like I need a rest after a big job. But today it would not start. Could it need more oil? I checked and the oil is at about half full (or half empty however you choose to see it). Next week I will take out the spark plug and see if that does it. Once you got to pulling the idle, whoa - that's just over my little non-mechanical head. I don't have an air compressor either. Squirt ether in the air cleaner? Phew, I don't even know what the air cleaner looks like on the mower. Where oh, where is that manual when you need it? I suppose this is what keeps small businesses like The Mower Clinic in South Euclid (where I take my reel mower every other year for blade sharpening) in business. Submitted by None on Tue, 10/27/2009 - 00:09. Gas is usually the issue, I use fuel stabilizer gas can go bad very quickly. You may want to drain the gas and put new gas in it, if you can find the fuel line. Usually a rubber line that just has a clip on it and then drain it into something. The air cleaner is usually a little metal box on the side usually it has only on screw in the center, inside is usually a sponge filter clean it with Dawn and warm water and wipe it all out then work a couple drops of oil into the sponge before replacing it. Check the plug and if it looks blackened go to auto zone get a new one, and get some starter spray you can spray the plug and into were it goes before putting it back in and check the plug line it may be shorting, it needs to be connected well. You need a socket wrench and spark plug adapter to get the plug in and out. When putting it back; start it by hand, to avoid stripping the threads. The air filter sits on the carburetor; air intake mixing with fuel that sprays across the plug that ignites it. Then also check the linkage, the cable from the controls to the mower, were it connects to the mower is the carburetor , it basically controls the fuel flow make sure its connected correctly and not slipping. It usually is a single metal cable and goes into one little hole on an arm that moves back and forth make sure its not slipping through the hole, when you move the lever it should move the arm the full range. All the way forward move the arm all the way up, then same with down and back. Let us know…you to can be small engine mechanic! Submitted by westward on Mon, 10/26/2009 - 18:00. I have plenty of leaves to mow if someone needs to practice. They are gold, indeed. Submitted by Jeff Buster on Mon, 10/26/2009 - 23:55. Half full of oil is OK, but don't let it get much lower. Since the engine was running and hot, the problem is probably starvation of some kind, either fuel or air - but not a spark problem. You need three things for fire - right? fuel, oxygen, and ignition. Ok, since the mower was running, it is not a clogged carb or lack of spark. If the engine dies like it was starving for fuel, it could be a clogged fuel filter. This could be an in line filter on the hose from the gas tank to the carb, or it could be a screen in the carburetor. Let's look at the other option first. It could be a clogged air filter. There is probably a little butterfly nut on the air filter cover on the side or top of the engine Take the cover off and you will find a sponge like filter fabric, or a paper filter. If they look full of dust and dirt, Clean them out. Shake, Vacuum, rinse in gas, whatever. With the filter off, try to start the engine. Any luck? I have also had the experience with a vacuum in the gas tank keeping the fuel from flowing to the carb.. Make sure the gas cap vent is not clogged. Lubricate the cap inside with wd 40 or the like. You can see the vent pathway. Submitted by ward14resident on Tue, 10/27/2009 - 03:16. Thanks for the tips. My mower died too. I am going to try these suggestions.